Experience true indoor and outdoor Florida living at Klosterman Oaks Village with its prime location on the border of Palm Harbor and Tarpon Springs. Honeymoon and Caldesi Islands beach are just moments away, and the Pinellas Trail is just steps from your front door. 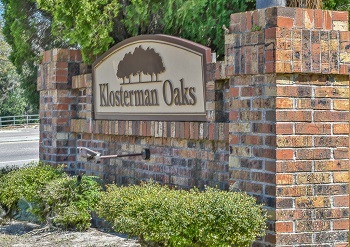 The well maintained homes for sale of Klosterman Oaks Village, located off Klosterman Road are roughly 1300 to approximately 2100+ sq. ft, with two and three bedrooms. A sampling floor plan includes a bonus room, a formal separate dining room, kitchen and family room combo or great room, a split bedroom, and a study/den/library. Plenty of parking space in the two car garages. Some of the beautiful pool homes are located on a private cul-de-sac and back up to a nature preserve for a private and peaceful setting. Enjoy year round swimming in your own in-ground, screen enclosed and heated pool. Close to shopping, fine dining and entertainment. This is a great area and one that you will be proud to live in. Selling your Home in Klosterman Oaks Village? Lipply Real Estate has been working in the Palm Harbor Community since 2002. We have many succesful and happy clients. When you are ready to sell your home please add us to the list of agents to interview. Call us today for a quote or enter your information in the form down below to see what is in store for you and your home.